I usually walk to work by way of grand residential streets. And I come home a few different ways, sometimes meandering and sometimes as the crow flies, cutting straight up through the ravine. So there are certain paths I only take at certain times of day. And although, of course, I still witness the gentle waves of seasonal change, I don't notice the small daily cycles each space captures. 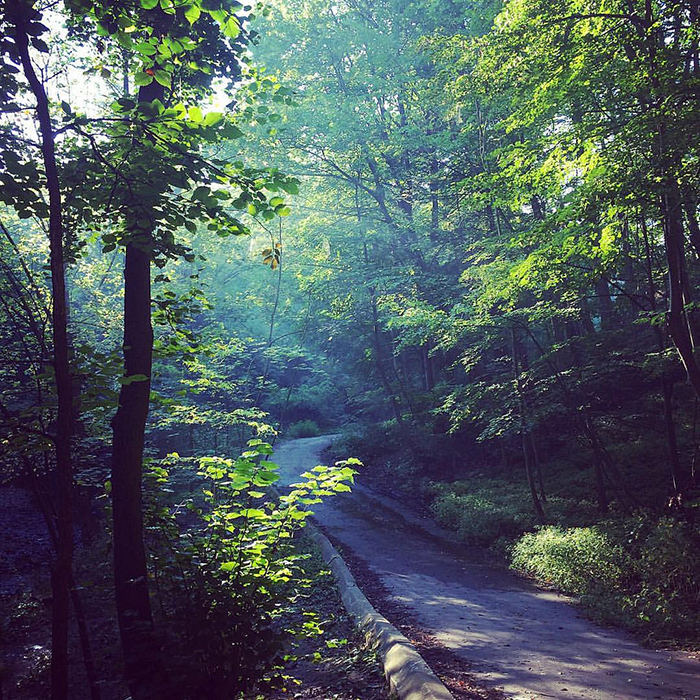 This week, I took the ravine in the morning. And it was something, to see the light hit the other side of the ravine as the sun rose. To watch crepuscular rays cut across the morning dew that had not evaporated. It was a different place than it is in the evening. It's easy to think that the natural world changes slowly; erosion, the growth of trees - they're happen in slow-mo compared to our short and hectic lives. Our overwhelming impression is that fragile as these places are, they're solid, unwavering. But this week I saw a fickleness that delighted me. And that it was as simple as seeing it at a different time of day doubled that delight. Victoria's home is just beautiful. I love her style. Beautiful writing by Belinda McKeon: "I like to teach it because it’s a piece of fiction which seems to enact—to make starkly tangible—the fundamental problem out of which fiction is made. That problem is distance. The distance to be attempted, the distance to be crossed; the many, many pools—each of a different depth and shape and temperature, each possessing its own particular murk and feel—through which a story must pass on its way to being a story." For many of us "freedom is just a *closes tab* away"
This man is my hero. I am the luckiest kind of immigrant, one who came entirely of her own volition. But I never forget that many fellow Irish men and women took the same path under much different circumstances. I will always be on the side of those trying simply to build a safe life somewhere new, and I'll never understand those who feel that threatens their world.